Smartphone addiction is becoming more and more common. Are you tied to your device? Take this official test to find out! Do you find yourself spending more time on your cell or smartphone than you realize? Do you find yourself mindlessly passing time on a regular basis by staring at your cell or smartphone? Do you seem to lose track of time when on your cell or smartphone? Do you find yourself spending more time texting, tweeting or emailing as opposed to talking to people in person? Has the amount of time you spend on your cell or smartphone been increasing? Do you wish you could be a little less involved with your cell or smartphone? Do you sleep with your cell or smartphone (turned on) under your pillow or next to your bed regularly? Do you find yourself viewing and answering texts, tweets and emails at all hours of the day and night—even when it means interrupting other things you are doing? Do you text, email, tweet or surf while driving or doing other similar activities that require your focused attention and concentration? Do you feel your use of your cell or smartphone decreases your productivity at times? Do you feel ill-at-ease or uncomfortable when you accidentally leave your smartphone in the car or at home, have no service or have a broken phone? According to the Greenfield Smartphone Compulsion Test...You're addicted. 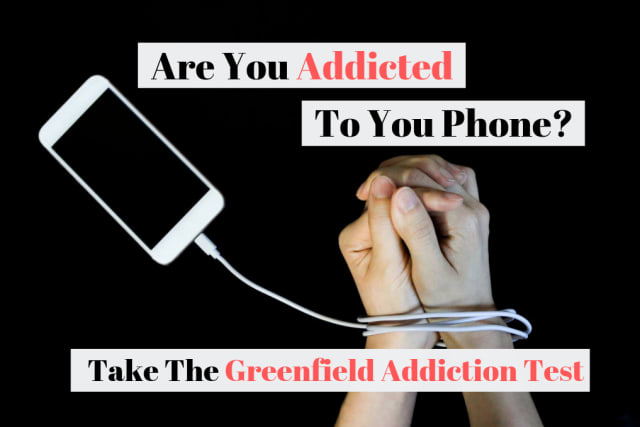 According to the Greenfield Smartphone Compulsion Test...You're not addicted. Good for you!